University of Ulster Irish scholar, Dr Art Hughes, will star in new documentary exploring the legacy of the Celts in Europe. Airing on BBC2 Northern Ireland, ‘Art agus TomaÃ­ san Eoraip’, is a four-part Irish language series which follows Dr Hughes and fellow broadcaster TomaÃ­ Ã“ Conghaile as they travel across Europe in search of Celtic traditions and cultures. Their journey embraces some of Europe’s most colourful Celtic festivals including the Festival de Cornouaille in Brittany, Altburg Festival in Germany, the Festa Major, in Vilafranca, Catalonia and the Trumpet Festival in the tiny village of Guca, Serbia, which attracts over half a million people each year. Dr Hughes, from the School of Irish Language and Literature, said: “One of my students, Ronan McCloskey, a documentary maker, asked me if I would take part in a new programme he was producing exploring Celtic culture, music, language and tradition across Europe. “Given my research background in the university’s Irish Celtic Studies Research Institute, I was delighted to take up the opportunity. 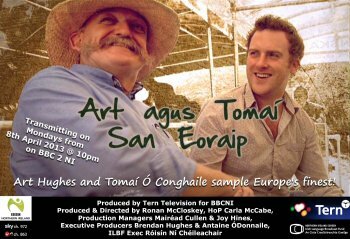 ‘Art agus TomaÃ­ san Eoraip’ will be transmitted on Mondays at 10pm from Monday 8 April on BBC2 Northern Ireland. ‘Art agus TomaÃ­ san Eoraip’ is a Tern Television production for BBC Northern Ireland, produced with support from Northern Ireland Screen's Irish Language Broadcast Fund.